Read more in the KONFIDO "Concept Paper". 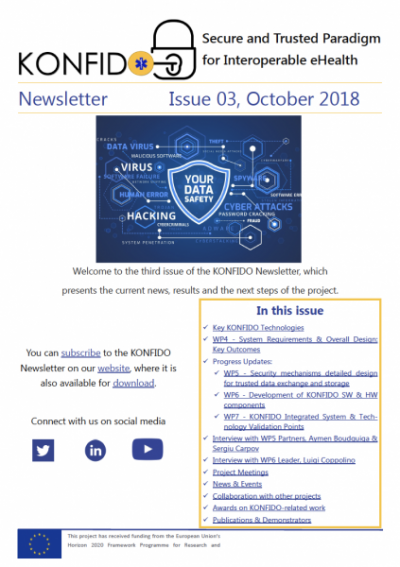 KONFIDO is a H2020 project that aims to leverage proven tools and procedures, as well as novel approaches and cutting edge technology, in view of creating a scalable and holistic paradigm for secure inner- and cross-border exchange, storage and overall handling of healthcare data in a legal and ethical way both at national and European levels. Kenneth is a 65-year-old citizen from Copenhagen, Denmark, who suffers from Chronic Obstructive Pulmonary Disease (COPD) and chronic heart failure as comorbid condition. Kenneth is planning to spend 10 days in Barcelona, Spain, with his family but is concerned about a potential exacerbation. His doctor informs him that thanks to the technology developed in KONFIDO, which has been deployed nationally in both Denmark and Spain, he can securely grant access to healthcare professionals in Barcelona to view part of his medical record. In this case, Kenneth and the healthcare professionals in Barcelona can authenticate themselves with their national issued eID. 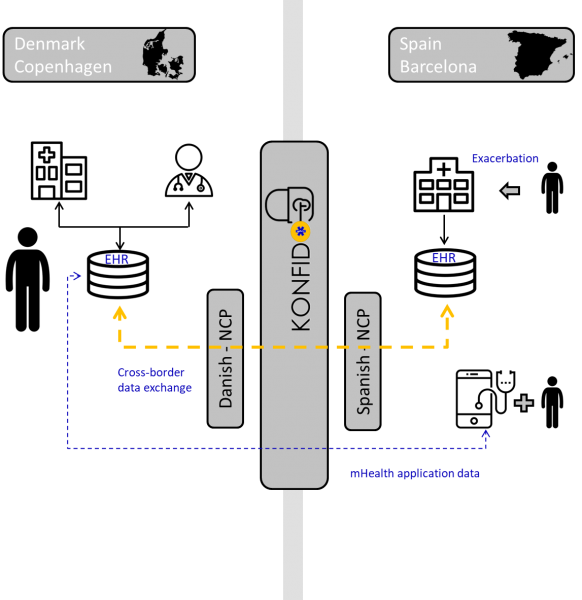 Using KONFIDO’s novel security mechanisms, Kenneth can be confident that data generated from any potential clinical intervention in Barcelona, including data coming from the use of a self-management mHealth application, will be securely transmitted and registered to his medical record in Denmark. This information will also be securely shared with the Danish specialist that is taking care of Kenneth, who can follow-up the incident. 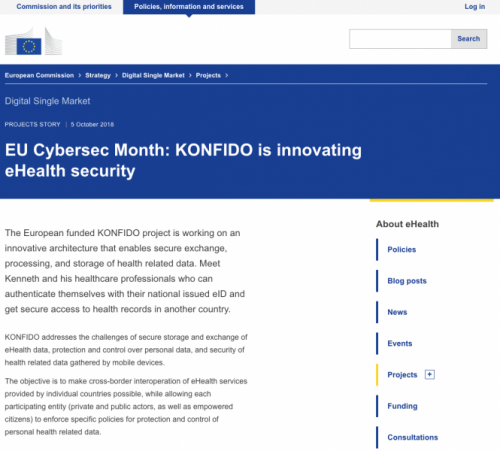 KONFIDO was featured in the "eHealth, Wellbeing and Ageing" EU newsletter, as part of the cybersecurity month projects story. The article is available here. Giovanni Mazzeo from CINI presented a paper entitled “Exploiting New CPU Extensions for Secure Exchange of eHealth Data at the EU Level” at 14th European Dependable Computing Conference (EDCC2018) that took place September 10 - 14, 2018 in Iasi, Romania. 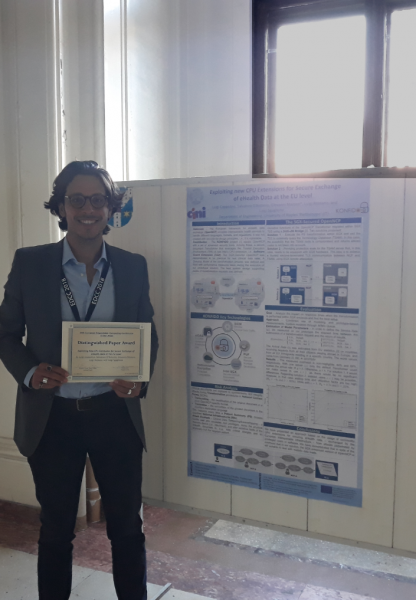 The paper, that described the activities related to the security enhancement of OpenNCP with SGX, won the Best Distinguished Paper award.